« New Grant Boosts Video Game Category of The Scholastic Art & Writing Awards! For Mary-Kate Lee and three of her Scholastic Award-winning brothers and sisters, the answer was simple: start a Celtic folk band. Bands as diverse as the Allman Brothers, Beach Boys, the Kinks, the Pointer Sisters, Hanson, Radiohead, Van Halen and the Jackson 5 all hail from sibling roots, and musical families have been the subject of TV shows and movies. But Seasons enters the scene as the first sibling band we’ve heard of composed entirely of Scholastic Award winners. The group was started almost five years ago by Lee siblings Peter Winter, Mary-Teresa, Mary Kate and Mary-Grace, who perform for churches, weddings, coffeehouses and even the Pennsylvania Renaissance Faire and Appalachian Brewing Company. 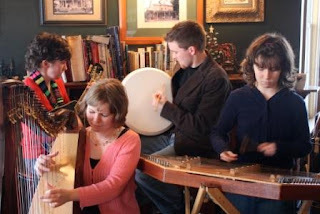 Music includes vocals, harp, hammered dulcimer, the mandolin, percussions and the penny whistle. The group has released two albums (Eventide Lullaby and Which Way to Dublin Town) and are hard at work composing original music for their third. Both albums have sold internationally and been reviewed by national publications. In addition to performing their own music, they’ve also been known to play selections from Lord of the Rings, Cold Play, Johnny Cash and Bach. Mary-Kate continues to balance her musical life with her writing. For her, the question isn’t “what can I do now?” but “what can’t I do?” Whether it’s a novel or a Celtic band, the possibilities are endless. See Seasons’ cover of Coldplay’s Clocks – with two djembe accompanists – here.